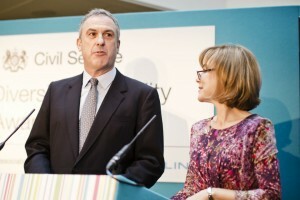 BBC Presenter Sian Williams and I co-hosted the 8th annual Civil Service Diversity Awards last Friday. 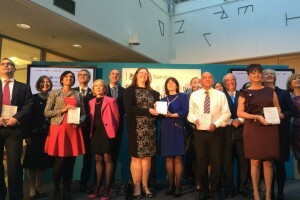 About 200 people attended the event hosted at the Ministry of Justice to hear this year’s winners. The winners of the Diversity and Equality Awards 2014. Well done to all the winners, and also to everyone else who was shortlisted for the Awards. This year we received 155 strong nominations – a 76% increase on last year. That tells me that there is a growing swell of interest and engagement on questions of diversity and inclusion. It suggests that more of us are thinking about the importance of diversity in our work and our culture is becoming more open and welcoming as a result. We should be realistic about our achievements because there is a lot more to do, but the Civil Service does have a positive story to tell when compared to many other organisations. I spoke to Head Teachers from around 50 UK girls’ state schools last week at their annual conference about our diversity work. I told them that in the Foreign and Commonwealth Office (FCO) for example, until 1973 women diplomats who got married had to resign (it’s true! ), that until 1987 all of our female ambassadors were unmarried and without children, and that until 1991 it was forbidden to be a gay diplomat. Thank goodness our story in the FCO is different now – we have been working hard in recent years to move things forward. Sir Simon Fraser and Sian Williams presenting at the Diversity and Equality Awards. highlight the upcoming changes to enable greater take up of shared parental leave (the revised policy is being developed by Civil Service HR with a view to rolling out in early 2015). Our leadership will be responsible for promoting a more inclusive culture, starting with the way they act and the decisions they make. It will no longer just be about having discrete pieces of work on diversity but a consistent and mainstreamed approach led from the top and down through each Department. To ensure implementation, we have set up a Diversity Strategy Team in Cabinet Office led by Andy Heyn, Director Governance Reform, working closely with Chris Last, Director General, Civil Service Human Resources and Janet Hill, Director Diversity and Inclusion. And I, along with my colleagues on the Civil Service Board and the other Permanent Secretary Champions, will monitor progress actively. The Action Plan will not be a static document. We will refresh it annually and as new evidence becomes available to ensure it stays relevant. We promised to commission further research to examine the barriers confronting people from an ethnic minority background, our Lesbian, Gay, Bisexual, and Transgender colleagues and people with disabilities in addition to the research we did on the barriers faced by women in the Civil Service. Three specialist consultants have now been appointed – Ethnic Dimension, Disability Rights UK and Ben Summerskill. They have started work, and aim to submit their reports by the first week of December. We will let you know more about how you can contribute to the research. It is important that everyone who wants to gets the opportunity to have their say. Some people ask me why I have taken on the role of Civil Service Diversity Champion. Perhaps they think I do not appear to be very “diverse” (though one of the important things about inclusion is that we should all be cautious about making judgements). I wanted to do this because I believe deeply that prejudice and unfairness are wrong. And because, as a Civil Service leader over recent years, I have become more and more convinced that the highest performing organisations are those which embrace difference and challenge, and where people feel comfortable and able to express themselves. It makes good business sense to have people with different backgrounds, with different experiences and different approaches to the challenges we face. It also helps us to carry out our commitment to deliver the highest quality public service for British people. I also believe that you don’t have to fit neatly into one of the 12 identified protected groups to have something to offer on diversity. We are all different: we all have our own personal story: we all have something unique to offer. For me, this is about positive action not positive discrimination. All of our appointments will continue to be made on merit, based on the ability of an individual to do the job. But that does not mean we can be blind to factors and barriers which may unfairly be holding people back.